Wednesday 18th September - Upper Street and the surrounding roads have so far not made it on to The List as I had been waiting to go with certain members of Team List (you know who you are). 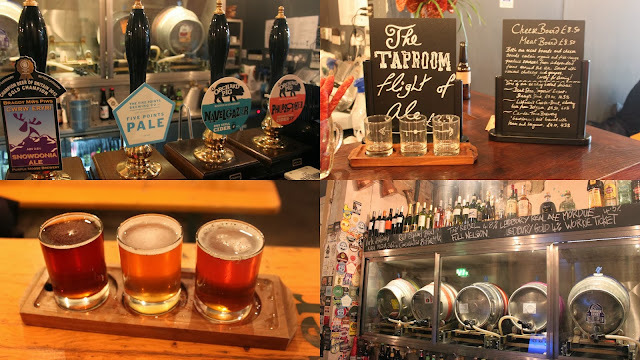 I caved last Wednesday as the lineup of bars, pubs and restaurants was becoming too long to ignore, and I felt North London needed some better representation on the blog. Taro stepped up to the plate and met me at Highbury & Islington for a slow walk down to Angel. I suggested going for food at the fairly new Fish & Chip Shop, but Taro was having none of it. Instead we headed straight for The Taproom, a popup beer bar on Upper Street that now plans to stay there for the foreseeable future. I was excited to see Five Points Pale on as I haven't had any of their beers yet, so I went for a pint of that straight away. It lived up to my expectations - hopefully I will make it to one of their brewery open days in Hackney soon. That said, I should probably have gone for the reasonably priced flight of 3 third pints of ale for £3.90 which I spotted too late. Taro did go for the flight, and left the barmaid to make two of the choices. He ended up with Tiny Rebel Full Nelson, London Fields Shoreditch Triangle IPA and Williams Bros Red Ale - a lovely selection, with Triangle IPA just about coming out on top. It's a really cosy place to drink, and we could have happily stayed there all evening. 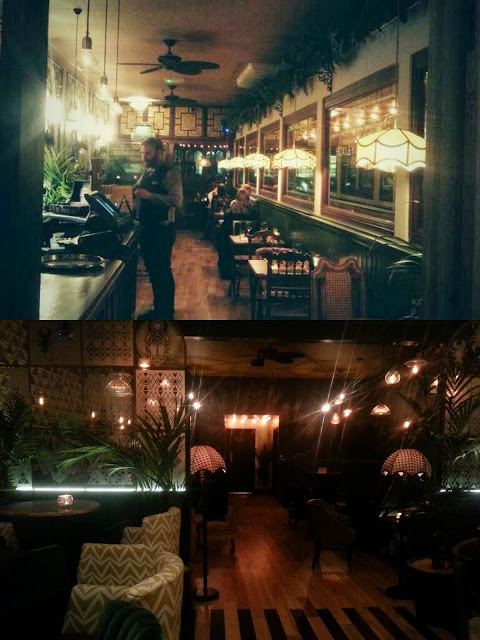 Tables are fairly low lit, meat and cheese boards are available, and they run a pub quiz most Tuesdays. 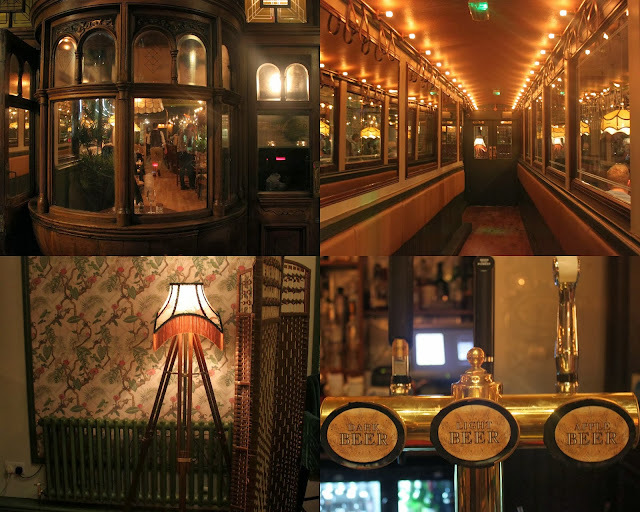 We tore ourselves away and wandered a few doors down to find Hoxley & Porter, a brand new bar and restaurant with a stunningly realised train carriage and travel theme. Upon entering, you walk down a long train carriage corridor, with views through to a classic dining carriage on your right before you reach the bar area which is slightly more exotic. As soon as we arrived, the barman (in train conductor regalia) came out from behind the bar to give Taro a big hug. I wasn't sure what was going on, so I demanded the same greeting before it became clear that Taro actually knew said barman. Unbeknownst to Taro, his friend Yih was manning the bar that evening after a few months away from the mixology game. We pulled up to two seats at the bar - always the best place to be - and got chatting. We were lucky to also have head bartender Mikey Pendergast, previously of Powder Keg Diplomacy in Battersea, sitting to our left, along with a current Powder Keg bartender. I have come across both of them before in passing at PKD and Ginstock 2013, but it was great to have a chat with them whilst they were off the clock. Despite it being a cocktail bar, I quickly surveyed the beer options as I always do. They are currently having to sell some standard beers on tap (two lagers and a cider, I think) because they are somehow affiliated with them, but they have cleverly removed the branding, and covered them with Dark, Light, and Apple Beer signs to fit in with the decor. Hopefully they will find a workaround and get some craft beers in to match the exciting cocktail menu. There were Redchurch beers in the fridge, including a Broadway Black Pale that I haven't seen before. Anyway, on to the cocktails. Taro started off with a boozy "My Daddy Owns a Yacht Club" which was all alcohol and incredibly drinkable. I had heard rumours of a colour changing cocktail with an edible absinthe-coated scorpion, so I enquired after it. Yih described it as their "halo" drink (i.e. the one to get the press talking) and Mikey got up from his seat to mix one up. It is a ridiculous concoction that involves some 95% Polish Rectified Spirit amongst other things. It changes colour instantly as you pour the final ingredient in, for reasons that were explained to me at the time but are now hazy. Most importantly though, it was extremely tasty, and dangerously easy to drink. Mikey described it as a cocktail that starts off like a Vodka Martini and ends up like a Rum Daiquiri, adding that he is well aware quite how pretentious that sounds. He continued to entertain, moaning about the need to include a champagne cocktail (which they gave a no frills name to, similar to Southsider Cocktail Club's "Token Champagne Cocktail"). As we were finishing our first drink, we were joined by North Londoner Tom, who had texted about watching the Arsenal match but was quickly drawn into the cocktail fun. He took Mikey's seat who left us in Yih's capable hands. Early press reported that there was a "Crypt" downstairs where you could homemade spirits and scorpions being prepared. This is apparently nonsense according to Yih - they don't have a license to take customers downstairs, and it is not at all glamorous down there anyway. Yih was constantly dishing out fascinating nuggets of information about his favourite drinks and the art of mixing. He made up a sour ("Chipotle off the Old Block" with powerful chilli bitters) for another table, and let us in on the dry-wet-dry shaking technique (without ice or with) which produces a super smooth drink with well defined bubbles. He is a rum expert, but happily took on Tom's request of making up something brilliant with gin. 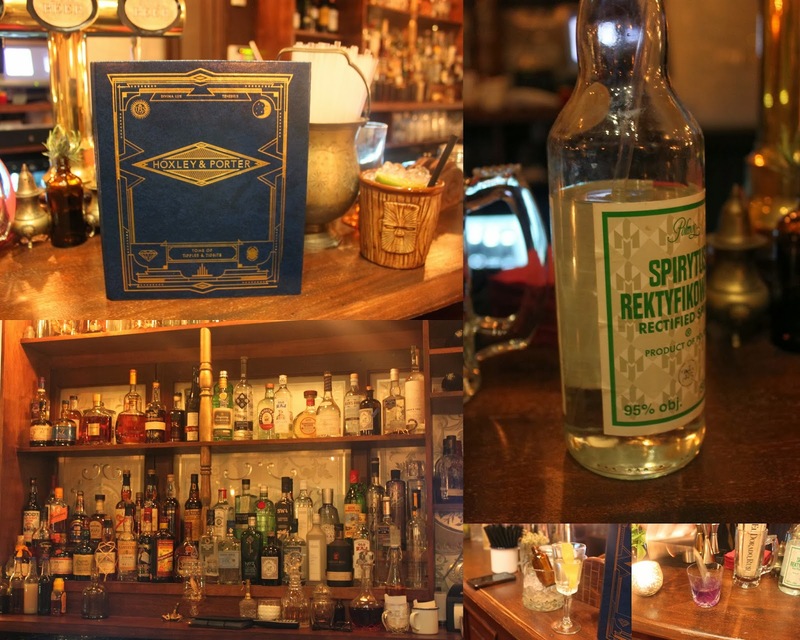 He gave us a taster of the delicious Hayman's Gin Liqueur before rustling up a sublime drink with it, which was presented in a small bottle on ice - similar to the presentation of a Henry Martini Rifle at Powder Keg Diplomacy. Taro went for a "Honey, Where's Mai Tai? ", Yih's signature (off the menu) drink - easily the best Mai Tai I have ever tasted. Meanwhile, I asked for his favourite strong rum drink, so he whipped me up a very special Rum Daquiri, with some extra Wray & Nephews's Overproof rum (one of H&P's most used spirits) for good measure. Every drink was an absolute winner, and we were all simultaneously jealous of everyone else's beverage. It was amusing to watch the bar staff dealing with one table who were constantly sending back drinks to make them sweeter, to the point where Yih suggested just giving them a bottle of syrup on the side. I find it hard to believe that their drinks weren't up to scratch, but I guess you can't argue with the customer. We eventually decided to make a move, and settled up a very reasonable bill. Huge thanks have to go to Yih for being such a fantastic host (especially with a taster of the awesome Plantation XO Rum). I will definitely return, though I would be sad if he wasn't there! The food is also meant to be exceptional, but we were just here for the drinks this time around. They currently have a super cheap lunch deal going, but I would imagine that it won't last that long, so head there soon! Oskar Blues Dales Pale Ale, Brugse Zot Brune, Moor Revival, Offbeat Grateful Deaf, Liverpool Beer Co American Red & IPA, Magic Rock Clown Juice and Arbor Twigs in Space were all sampled. 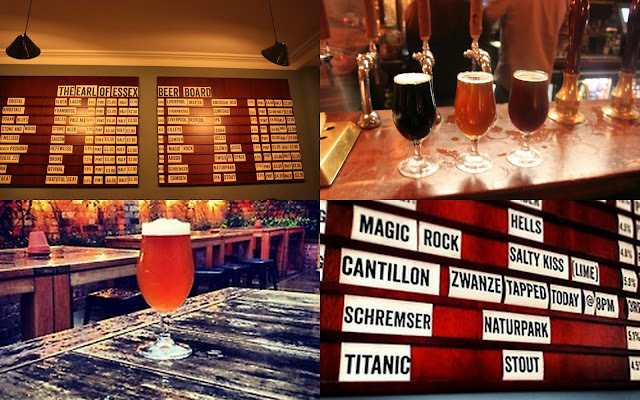 I was particularly impressed by the Liverpool Beer Co offerings. Moor Beer Co (Somerset) continue to be one of my favourite breweries. There are lots of great beers in the fridge too, including some craft cans all the way from Maui in Hawaii - Maui Brewing Co Big Wave will convert you to canned beer. It's a very friendly pub, and the staff looked after us very well (especially hungry Taro - see his previous List form here). Everything on the food menu is paired with a beer that they should have in stock. There is a nice garden out back too, though we don't have many beer garden days left this year. Whilst Tom and I chatted about football, Taro befriended a barman who works round the corner at Smokehouse - a new gastropub (near the top of The List's most wanted) with smoked meats and a huge amount of beer on tap. It is one of many places around Upper Street that I need to start ticking off - House of Wolf, John Salt, North Pole, 69 Colebrooke Row, Ottolenghi and Slim Jim's to name a few! Thanks to Tom and Taro for kicking off the Islington List exploration. Since this is a pretty beery post, I'll quickly mention some beer news. 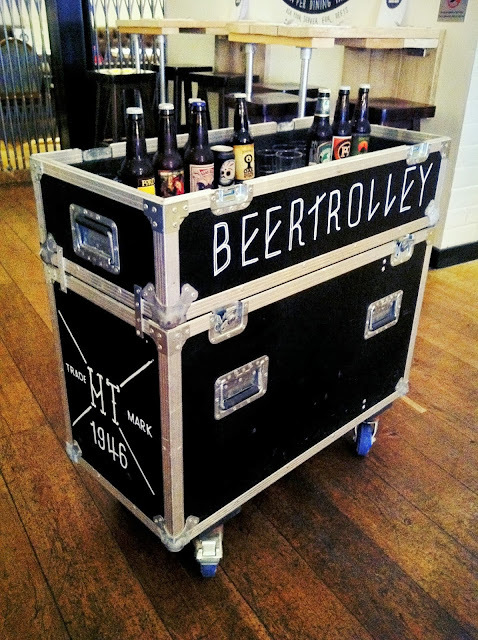 Honky Tonk (Chelsea & Clapham Common) have just launched London's first "Beer Trolley". 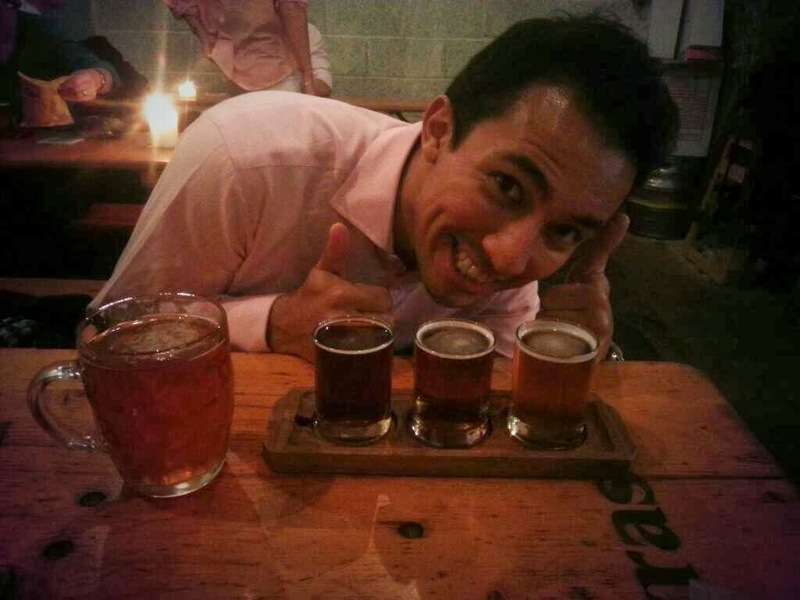 A beer sommelier will wheel the trolley around to diners, and take them through various options that will hopefully match your food! Thanks to Hollie from KK Communications for the heads up. Honky Tonk have also started presenting your bill inside a book, which you can take home if you so wish. They are considering turning it into a full on book exchange! 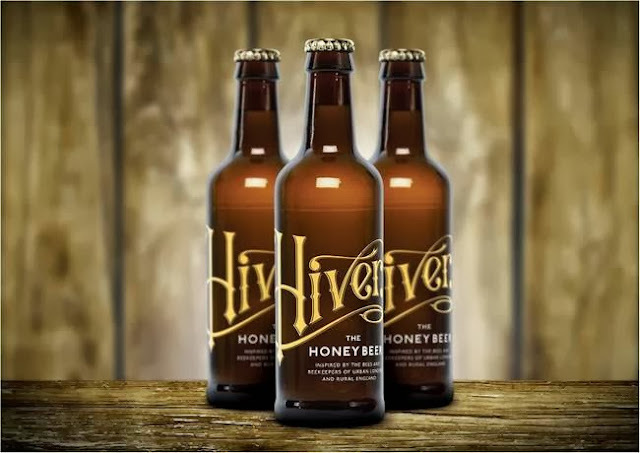 Also, keep your eyes peeled for the refreshing new Hiver honey beer which I had a taste of at Bermondsey Street Festival on Saturday. It is currently on sale at The Hide Bar in Bermondsey, but should also be available elsewhere soon (if it isn't already). Follow them on Facebook/Twitter for more info, or sign up for updates on their website here.